ENGLEWOOD, Colo., June 1, 2018 /PRNewswire/ -- Golf Digest Online (GDO), the largest online / offline golf conglomerate in Japan, has expanded its partnership with GOLFTEC, the world's largest provider of premium golf lessons and club fittings at nearly 200 GOLFTEC centers internationally. The partnership centers on GDO's US entity, GDO Sports, Inc. acquiring majority interest in GOLFTEC with plans to merge the strengths of both companies to further grow the business globally. The transaction – with units purchased by GDO from an investor group led by Gart Capital Partners – is scheduled for completion on July 2, subject to customary closing provisions. Existing GOLFTEC leadership will remain in place to drive expansion and operational excellence while Gart Capital Partners will retain a minority position and continue to be actively involved in managing the partnership. Publicly traded on the Tokyo Stock Exchange and with 550 employees, GDO previously held a minority stake in GOLFTEC, operating 10 franchised "studios" in Japan since opening its first in the upscale Roppongi district of Tokyo in 2012. In addition to GOLFTEC, its retail holdings include GDO golf shop, the largest online retailer of new and pre-owned golf gear; Golf Garage, a five store brick-and-mortar golf store that buys and sells new and pre-owned golf equipment and golf accessories in Japan. The company also operates the largest online tee-time booking service in Japan with over 2,000 courses and publishes multiple golf news websites. A leading employer of PGA Professionals, GOLFTEC's 700-plus certified coaches have conducted more than eight million lessons. Comprehensive analysis of swing mechanics helps students of all skill levels shave an average of seven strokes off their games. The success also stems from GOLFTEC's leading-edge technology that leverages swing data and allows students to see real-time video and motion measurement simultaneously. The result of this fact-based approach is students reporting a 95% satisfaction rate. 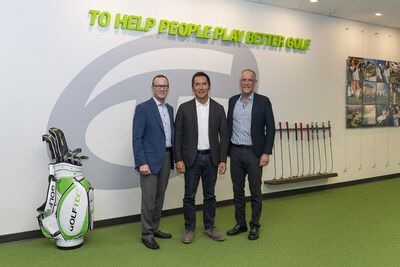 "We are connecting the world through golf and GOLFTEC's global presence and effectiveness with students are tremendous assets to achieve this vision," said Nobuya "Mike" Ishizaka, Chairman and CEO of GDO that he founded in 2000. "Helping golfers around the globe to play better and enjoy the game is vital for the success of the golf industry, and so GOLFTEC will be an impactful addition to our group." "GDO's influence in Japan, broad golf platform and significant overall resources are integral to the future growth of GOLFTEC and students' experiences," said Joe Assell, Co-Founder and CEO of GOLFTEC. "Approaching our 24th year, it's gratifying to grow GOLFTEC from a single location to a progressive, results-oriented teaching force – the sky's the limit." The partnership parallels record-high revenue for GOLFTEC in company history. Recently, instruction centers were converted to a new, contemporary and vibrant design scheme that creates dynamic and holistic atmospheres tailored to total golf immersion. GOLFTEC also debuted proprietary TECFIT club-fitting software that scientifically blends swing characteristics and ball flight data to identify the proper equipment – among thousands of clubhead and shaft combinations – for each unique player. Since 1995, GOLFTEC has become the world's largest provider of premium golf lessons and club fittings. Headquartered in Englewood, Colorado, it operates nearly 200 corporate-owned and franchise instruction centers in all major U.S. cities as well as Japan, Canada, Hong Kong and Singapore. A leading employer of PGA Professionals, its 700-plus certified coaches have conducted more than eight million lessons with students reporting a 95% success rate and an average reduction of seven strokes off their scores. Backed by GOLFTEC's revolutionary SwingTRU Motion Study, leading-edge technology leverages swing data and allows students to see real-time video and motion measurement simultaneously. This completely fact-based approach to instruction, practice and club fitting has led to rave reviews from Bloomberg BusinessWeek, CBS, CNBC, CNN, Fast Company, Forbes, Fox Business, Golf Channel, Golf Digest, GOLF Magazine, Golfweek, Inc., Yahoo! and many others. Founded in 2000 and headquartered in Tokyo, Japan with 550 employees, Golf Digest Online (GDO), Inc. is Japan's largest golf business and publicly traded on the Tokyo Stock Exchange. GDO is unaffiliated with Conde Nast and its Golf Digest Companies. Its retail operation comprises 10 GOLFTEC instruction centers, five brick-and-mortar golf stores in Japan, and e-commerce focused on trade-ins and sales of new and pre-owned golf clubs. Moreover, for more than 2,000 golf courses in Japan, it provides tee-time management software and is Japan's largest online tee-time booking agent. GDO's media division operates multiple golf-centric, advertiser-supported websites and also provides multiple online services as well as numerous real-time events. Gart Capital Partners is a private equity investment partnership located in Denver, Colorado. This firm is a division of The Gart Companies, a family investment office with diversified holdings, and invests in closely-held and family-owned retail, consumer and services businesses.